An additional chapter of the book diseases of the Waves, how to be preserved. On January 29th, 2015 the Senate finally adopted after thousand difficulties the law bee, thus recognizing possible harmfulness for the young children of their exposure to WIFI. For the first time also on this occasion the word “electrosensibility” appeared in an official text. – In the establishments mentioned in chapter IV of title II of book III of the second part of the public health code, the installation of fixed final equipment equipped with a wireless gateway with Internet is prohibited in the spaces dedicated to the reception, rest and the activities of the children of less than three years. – In the classes of the elementary schools, the wireless gateways of the equipment mentioned with article 184 of the law n° 2010-788 of the bearing July 12th, 2010 national engagement for the environment installed after the publication of this law are disabled when they are not used for the teaching digital activities. III. – In the elementary schools, all new installation of a radioelectric network is the object of preliminary information of the preliminary council of the council of school. Within a period of one year as from the promulgation of this law, the Government submits to the Parliament a report on electro-over-sensitiveness. Deliberated in public, in Paris, on January 29th, 2015. Already in 2001 a European parliamentary report disadvised the use of the mobile phones by the children taking into account their exacerbated vulnerability at certain electromagnetic frequencies. “The Wi-Fi networks in school are hundreds of times stronger than the systems used in residence. Indeed, these systems must connect hundreds of computers simultaneously, from where their more important power, and from where the problematic exposure of the children, who are most sensitive, lasting of long periods over all the day, and this during all their childhood”. An increasing risk of behavioral problems. While being based on the analysis of more than 1,800 new scientific studies, the report showed that the young children and the pregnant women were well a population at risk. The exposure to the waves of the telephones and wireless technologies would deteriorate the cerebral development of the foetuses and the new-born babies. Thus the risk of hyperactivity, and behavioral problems could increase. This antenatal exposure to the waves appears logically worrying because it is at this time that the brain of the foetus is most fragile. Billion multiplications cellular occurs, in particular on the level as of encephalic cells. The brain accounts for approximately 10% of the weight of new-born babies, whereas it accounts for 2% of the weight of an adult. For its development there are needs increased for blood irrigation and there are then more risks that poisons pass through the barrier and hémato encephalic. We know thanks to work of professor Dominique Belpomme that the electromagnetic waves will open this barrier which normally is a Maginot line which should not let pass any toxic substance. According to a Danish study published in 2008, the foetuses exposed to the waves would have 54% of risks besides presenting behavioral problems during their life. Epidemiology is the study of the influential factors on the health and the diseases of the populations. It is interested in the distribution, the frequency and the gravity of the pathological states. For about thirty years have had note a very worrying recrudescence of certain diseases in the children and the teenagers. It is the case in particular for some turbid of the attention, some turbid like the very activity, the autism, and certain cancers. Without speaking of allergies, intolerances food, chemical, and respiratory problems. According to the French agency of public health of the environment and work 3 to 8% of the European children would be concerned with disorders and disorders of the neurological development (NDDs). These disorders are present dice the birth or appear at the time of adolescence and are characterized by physical, psychic, cognitive dysfunctions and language, with deficit of the attention and backwardnesses. That represents public health problems today. The case of the autism is particularly worrying. The figures make fear. A case for 1000 in the Eighties. It was necessary 7 years so that France recognizes the data on the prevalence of the autism of 1 birth out of 150. Today these data are in increase and one admits 1 birth out of 100 with the international level. Other studies go even further and one announces already a prevalence of 1 birth out of 50. Even if the systems of diagnosis are more powerful today everyone agree to say than this increase is considerable. In England, the office of the national statistics indicates an increase of 50% of the tumours of the frontal and temporal lobes in the children between 2000 and 2010. In 2004, the International research Center on Cancer (CIRC) concluded from a great European study on the infantile cases of cancers based on 100000 cases distributed over 30 years, that the number of these cancers had increased significantly by 1 to 1.5% every year. Another study published in 2001 by the researchers of Cancer Research Campaign (CRC) revealed an increase in the same order (from 1 to 3% a year) in the North-West of England between 1954 and 1998. The causes which can explain these health problems are badly elucidated. It however appears obvious that such an increase in these diseases in the children during one also short time of time can have only environmental origins and probably multi factorial. Among those, there is not any doubt today that the exposure of the pregnant woman, the foetus, and the young children to their electromagnetic environment with a great part of responsibility. But today a new science brings a new glance and other explanations to us on the consequences of the whole of this environmental pollution, which they are chemical, or electromagnetic. It is the epigenetic. What is the epigenetic ? The epigenetic, is initially this idea that there does not exist fate in our evolutions, that we are not determined by our embarrassments to become this or that, and that all is not registered in our DNA. More precisely, “the epigenetic one is the study of the changes of activity of genes – thus of the changes of characters – which are transmitted to the wire of the cellular divisions or the generations without calling on changes of the DNA” (Vincent Colot, specialist in epigenetic in the plants at the Institute in biology of the higher Teacher training school ENS-CNRS-Inserm, Paris). The gene does not change, but its expression can thus change during the life, and this expression can become hereditary. These modifications of the form of genes would occur inter alia following environmental changes. For example in an unquestionable way is known that modifications of the food can involve modifications of the color of peeling in the mouse and that they are hereditary. The examples of this nature are numerous. The biologists tell us today that the genes can be “lit” or “extinguished” by several types of chemical modifications which do not change the sequence of the DNA: méthylations of the DNA, but also of the changes of histones, these proteins on which is rolled up the DNA to form chromatin. All these modifications constitute as many “epigenetic brands”. They mark out the genome into cubes precise sites, modulating the activity of genes located on these sites. We are matter beings as much as beings of energy. Electromagnetism invades biology, and there exists an electromagnetic component for each biological process. Whereas biology S ' is mainly satisfied with chemical explanations on why and it how operation with the cells, there exist the numerous ones and attractive preliminary search listings which show that electromagnetic changes accompany practically all the biological changes. The question which should be raised : they which are the epigenetic modifications which can be installation by the electromagnetic environment in which bathes today the human being? Following these environmental aggressions of all natures, and their psychic consequences, epigenetic deteriorations would occur and accumulate with the years. More and more of enquiring biologists show that the wave orders with the particle, in other words that informational vibratory signals are clients with the molecule, chemistry while being only the executant. One cannot whereas to wonder about the consequences of the environmental electromagnetic interactions on the human genome. 86 new articles and publications relating to the study of the effects genotoxic of the radio frequencies were published between 2007 and 2012.54. 63%, show effects and 37% do not show effects. For the effects genotoxic of extremely the low frequencies (ELF), 43 new studies were published, between 2007 and 2012 81% of them show noxious effects. The “biological effects” of the physiological, biochemical or behavioral changes of order which are induced in an organization, a fabric or a cell in answer to an external stimulation are usually reversible and are within the limits of homeostasis (i.e. of the internal regulation of the organization). Any biological effect does not pose a threat for the health of the person; it can express the “adaptive” answer simply normal of the cell, fabric or the organization to this stimulation. But when does this effect involve modifications on the level of the genome and DNA, i.e. when do these modifications become hereditary, therefore transmissible, isn’t one in right to worry? Will the human being be able to adapt to this news give environmental thanks to the adaptability of the expression of its genes? That will be perhaps possible if we are too quickly absorbed by the whole of the harmful beachcombers only humanity car manufactures ourselves, like finishing some more quickly with itself. The danger of the exposure of the foetus and the young child to the electromagnetic waves. A large number of studies confirm today the biological effect of the various electromagnetic frequencies environmental on the young child. The exposure of the pregnant woman would have medical consequences on the foetus with serious consequences on the future and to become it of the child. More still, these disturbances and cellular constructional defects due to the waves could involve medical disorders on the following generations. A consensus is being born in many specialists in neuropsychology, neurotoxicology, and doctors pediatrists on these problems. Children who are born in a country but which emigrates very young person will tend to develop in their new fatherland of the diseases which are frequent on their birthplace. Contrary those which are born in their host country common diseases in this birthplace develop. It would seem that it is the environment at their foetal stage and during their any early childhood which would determine the prevalence of some turbid of health. That would like to say that these are not the genetics which would be responsible for certain pathologies, but that they would be modifications of the epigenomist due to the environment which would take the responsibility for there. The environment would be more important than the DNA! The case of obesity in the Western countries is also interesting. In 15 years in the United States one passed from a prevalence of obesity of 10% to 37% today. What is most dramatic, it is in the children. One did not see obese children 30 years ago while now one is to 12 or 15% in this population. We saw also a pandemia of diabetes 2, parallel to thepandemia of obesity. The diabetes of the type 2 is a disease characterized by a chronic hyperglycemia, i.e. by a too high rate of glucose (sugar) in blood. This disease generally occurs in the adults advancing in age, and more touches the obese people or having a surplus of weight. At a healthy individual, the control of the glycemia is done by insulin, a hormone secreted by the pancreas. Insulin allows the entry of sugar in the cells so that it is used as fuel, particularly in the muscles and the liver. At a person reached of diabetes of the type 2, the organization becomes unable to control the glycemia, i.e. the rate of glucose in blood. At this point in time the glycemia rises (one speaks about hyperglycemia). In the long run, if the glycemia is not lowered by treatments, that can cause serious health problems, in particular cardiovascular problems. The “disorders of the autistic spectrum” (TSA) is a formula which indicates the whole of the symptoms characterizing the behavioral problems related to the autism. Besides the autism known as “classical”, which results in an absence of verbal communication, a disorder of the social interactions, as well as repetitive and stereotyped gestures, the TSA also include the syndromes To sprinkle and of Rett. In the case of the syndrome To sprinkle, the development of the language is not affected, and the person does not show of backwardness. A child on 100 in the western world suffers from a form of autism. For the moment, there does not exist any treatment able to cure the autistic disorders. It is necessary to distinguish what is the problem of the diagnosis and the problem of the real cases but in any event the increase is real since one passed from a child over 1500 100 years ago with a child on 65 in the United States. In this country, in 11 years, from 1992 to 2003 one passed from 15000 to 163,000 cases of autism. The prevalence of this disease increased 10 times. This increase is about the same one in England. We can speak about a quiet pandemia of autism. The assumption of responsibility is only symptomatic and passes by personalized educational therapies. These last obtain a maximum of effectiveness when they are applied at an early stage of the development of the disease. At the Institute Pasteur, l’Unity of human Genetic research and cognitive functions, directed by Thomas Bourgeron (Professor at the university Paris Diderot), was the first to confirm the genetic track of the autism: in 2003, it identified changes located in certain genes which take part in the operation of the synapses, which are the points of contact between the nervous cells. Thereafter, it highlighted several other genes implied in the autism and, which also play a part in the transmission of neuronal information. Parallel to this work, of the genetic mechanisms at the origin of significant drops in melatonin (hormone implied in the rhythms harms/days) could also be identified. In the same way the number of cancers does not cease growing, and it is estimated that a person on 2 will be touched by this disease in about ten years. This increase concerns more and more the infants. A child on 600 is reached of a cancer each year. The source of publication is the National union of Associations of Parents of Children reached of Cancer result from studies of the French company of the Cancer of the Child. In 2004, the International research Center on Cancer (CIRC) concluded from a study based on more than 100,000 cases of infantile cancers distributed over 30 years, that the number of cancers had increased significantly by 1 to 1.5% every year. Another study published in 2001 by the researchers of Cancer Research Campaign (CRC) revealed an increase in the same order (from 1 to 3% a year) in the North-West of England between 1954 and 1998. Electromagnetic waves, and pesticides, would be for the specialists in environmental medicine responsible for these cancers and their increase, progressive but alarming. Let us recall how it was necessary nearly fifty years so that the tobacco is recognized carcinogenic! Each time a living organism is subjected to an electromagnetic field it occurs an oxydative stress with proteins of the stress. With long, it would become mutagen. In the adult of the processes of DNA repair exist, but in the foetus and the child that is more difficult. In sensory construction neuro, billion cellular proliferations, multiplications and differentiations occurs, controlled and directed by the epigenomist, him even under influence of its environment. Experiments on the rats go in the same direction. If they are exposed in the first times of their life to high electromagnetic radiations or low frequencies the synaptogénèse is disturbed. Chemical pollution will have a synergistic action following the modification of the barriers hémato encephalic and intestinal. The latter letting pass from the pollutants which will be found in brain. The autism should be one of the great consequences of these noxious processes. This trans-placental and even gametic exposure would be responsible for these disorders of health and not of the stochastic changes, i.e. random. The DNA represents only part of a complex network of action leverages, multiple gears and broad networks. It would be final to the epigenomist who would tend to change the expression of the DNA under flow of information perpetual coming from the environment. Environmental electromagnetic pollution as chemical pollution would impact the pregnant woman, the foetus, and the child in the first times of its life and would have consequences not only on the subject itself but also on its descent. 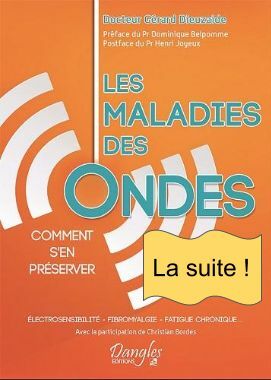 These ten last years, the scientific and medical voices which protest against the waves of wireless technologies are increasingly numerous and their increasingly clear messages. Today there exist 3300 scientific publications at reading committee denouncing the adverse effect of the electromagnetic waves on health. (The scientific publication term gathers several types of communications which the scientific researchers make their work in the direction of a public of specialists, and having undergone a form of examination of the rigour of the scientific method employed for this work, like the examination by an independent reading committee. One speaks then about the scientific literature to speak about the whole of the scientific publications). The pregnant woman, the new born one, the children and the teenagers are more vulnerable and they should be protected more than all others. Of course while referring to the advices which are stated at the end of this book, but also with particular measures, like plaids and maternity girdles anti-waves. Is Andras Paldi, the epigenetic one lamarckienne? , conference at the National university of June 29th, 2009.